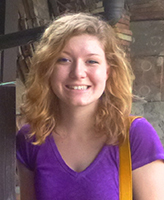 Pickard’s experience generated an idea for her senior thesis project. Bridging her interest in East Asian culture with her sociology major, she decided to research the integration process of East Asian students on the Notre Dame campus. “My thesis studies the kinds of values students hold, how those values may be shaped by their Asian ethnicity, and how that affects their integration into a Western university,” she says. Jessica Collett, an associate professor in the Department of Sociology, worked with Pickard to design a survey to disseminate to international students. She says that a senior thesis enhances a student’s undergraduate experience and “cultivates a different set of skills” than a traditional course. She expects Pickard’s research to help make the Notre Dame community more inviting. “Her research will offer insight on how to create a more inclusive and rewarding experience for international students, as well as enhance the entire Notre Dame community,” Collett says. According to Pickard, the difficulty of this study—as with any sociological research—is trying to determine the root cause of human behaviors. Pickard credits this aspect of her sociology major with helping her to be more open-minded and better prepared to adapt to different situations. 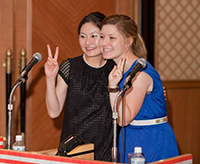 Pickard studied abroad and interned in Nagoya, Japan. During her time at Notre Dame, Pickard has gained experience collecting and analyzing data at Notre Dame’s Interdisciplinary Center for Network Science and Applications (ICeNSA). The research center addresses network and data science issues with an interdisciplinary team of computer scientists, engineers, biologists, physicists, mathematicians, and social scientists. She began working at ICeNSA as a sophomore, on a research project examining the social ties that students create upon entering a university and how their social networks evolve over time. This project not only helped prepare her for the independent research in her thesis project, but also caused her to reflect on the importance of students’ social networks as they adjust to college life, she says. Following graduation, Pickard would like to return to Japan for a year. She hopes to participate in the Japan Exchange and Teaching (JET) program, which provides the opportunity to work as a language teacher in a Japanese school or international relations coordinator at a government office. Originally published by Ben Horvath at al.nd.edu on March 27, 2014.